Hands Together was founded in 1986 by Fr. Tom Hagan, O.S.F.S. 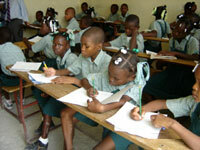 as an outreach program to help the poor in Haiti and the local community of Easton, PA. The driving force behind all of Hands Together's efforts is the Catholic Social teaching which challenges us to care for the least of our brothers and sisters. Hands Together is incorporated in the state of Pennsylvania and governed by a board of trustees who receive no compensation for service. An executive director and a small support staff run the organization in the U.S., and Fr. Tom Hagan anchors the activities in Haiti where he resides. All of Hands Together's outreach programs are Haitian-run, providing employment for hundreds of people in Port-au-Prince and Gonaives. Periodically, U.S. volunteers contribute training and guidance for educational, medical and sustainable development projects. Hands Together maintains offices in Chicopee, MA, and Port-au-Prince and Gonaives, Haiti. Hands Together created a Haitian NGO - Men Ansamn/Mains Unis (Hands Together) that encompasses the projects and activities from rural areas and additional projects and is headed by the Archbishop of Port-au-Prince, Max Mesidor. Individual donations, proceeds from Catholic Mission Appeals, private foundations, funding from partner organizations, and fund raising events provide Hands Together with the bulk of its revenue each year. Hands Together collaborates with other organizations whose mission closely mirrors our own. 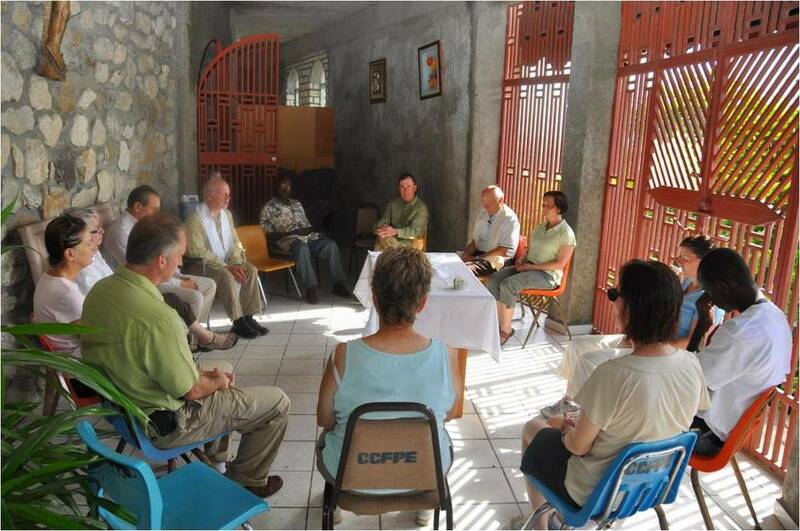 Partnerships with local Haiti diocesan Caritas, the Missionary Sisters and Brothers of Charity, local peasant groups, and many other organizations allow for the sharing of resources and establishment of effective relationships. Our more recent partners include: Mary's Meals, who help us with our school feedings; Digicel Foundation, who helps us with school rebuilding and materials, BND, a Haitian NGO dedicated to nutrition and development; and the Canadian Agency for International Development who funds our large-scale efforts in environmental projects. We use our water-drilling equipment to assist many local NGO's and relief organizations in need of wells. In the United States, we join with hundreds of diocesan mission offices who support our work through prayer and financial contributions. We share our faith and mission work with U.S. parishes, schools and youth groups to educate, inspire and increase missionary involvement among U.S. Catholics and others.